Duck in the Truck and Hit the Ball Duck–These are books that I was introduced to through my new Usborne business. My boys are LOVING these books with Duck, Frog, Goat, and Sheep as they get into some precarious, yet hilarious, predicaments. Jez Alborough is a new favorite author, thanks to these books! Animal Trunk: Silly Poems To Read Aloud–I am trying to be more proactive about incorporating poetry into our literary diet. I grabbed this one by chance off the library shelf, and it has been a hit! My 4 year old and I had a pleasant, giggle-filled time reading this prose about various animals. See Inside Your Body–This is another book that I was introduced to thanks to my new Usborne business! 🙂 We are studying the human body in Classical Conversations this year. I wanted an age-appropriate yet densely informative book to read at home with my boys so that they could glean more details about our bodies. We have, thoroughly, enjoyed it, and the “Lift-The-Flap” component makes each page an adventure! Two thumbs up for this book from all 3 of my boys. Do you want to read to your kiddos but don’t know where to start? This book will help! The beauty of this book is its two segments. The first division of the book is the inspirational, fact-based, oh-so-convincing treatise as to why we should read aloud. The last section of the book is page after page after page of book recommendations. Each book entry contains a short summary of the book and suggested age/grade for the target audience. Take this book with you to the library and let it introduce you to some classic, “read-it-again-Mom” books and authors. Here’s your subliminal message for today–Read this book. Read this book. Read this book. (Subliminal message is over.) I truly believe that all children can become book lovers, and no, it won’t always happen overnight and takes an investment of time from the parents. However, this is one of the greatest gifts that a parent can bestow on their child. As Trelease so eloquently writes, “the least expensive thing we can give a child outside of a hug turns out to be the most valuable: words” (page 16). The Digital Invasion: How Technology Is Shaping You and Your Relationships–I first heard about this book over the summer when I read a blog post titled The iPad is Stealing My Son’s Childhood. I was intrigued by the title of the blog post and had to read it. The blogger wrote the post after reading The Digital Invasion. Does any other parent have to answer this question “Can I play the iPad?” oh, about a hundred times a day?!?!? I was intrigued by the premise of The Digial Invasion and immediately added this book to my “to read” list. My reservations going into the book were that there would be lots of scare tactics and undocumented assertions about technology. I actually began reading the book with much skepticism but, in the end, resonated with the book. The authors, a psychologist and a counselor, offered much food for thought regarding the influence of technology on families and relationships. Let’s face it. We have all been in a restaurant and noticed a table nearby where all gathered ’round the table have eyes glued on phones or devices. I always look at those scenarios and tell myself, “I don’t want that to be my family. I want us to talk to one another.” The Digital Invasion left me with much to ponder about technology, my sons, and our family. The bottom line is that technology is influencing us, whether we want it to or not. The Digital Invasion was an encouragement to me to evaluate, be aware and mindful, not oblivious, of technology’s role and influence in my life and my loved one’s lives. It has been the impetus to some healthy, on-going converstations between my husband and I about our desires for our family. Owl at Home-We are huge Arnold Lobel fans in our home! My second son is currently read this aloud to us during school time, and it is a laugh-a-minute! Lobel also wrote one of our other “Mosley favorites”–the Frog and Toad series! Introduce your kiddos to Arnold Lobel! Love, love, love his books! Here is a list of Arnold Lobel’s other books . 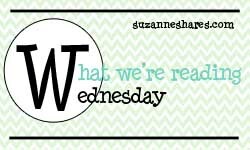 Pocahontas and the Strangers –We are studying American History this year…and loving it!! My oldest son is reading this book aloud, and we love the author Clyde Robert Bulla, who has written a tome of fabulous books for children. We are enjoying this Pocahontas biography. We might have to watch the Disney version and compare the movie and the book! Should be interesting! HAHA! Pedro’s Journal: A Voyage with Christopher Columbus, August 3, 1492-February 14, 1493 –This historical fiction gem is a collection of journal entries from Pedro, a young cabin boy for Christopher Columbus during his expedition with the Nina, the Pinta, and the Santa Maria. This has been a fun read for us! It offers a unique perspective on the oft-told tale of Columbus and his journey “to India,” and the literary vehicle of a journal gives a personalization to this historical event that I had missed when studying it previously. So, that’s a wrap for this week! 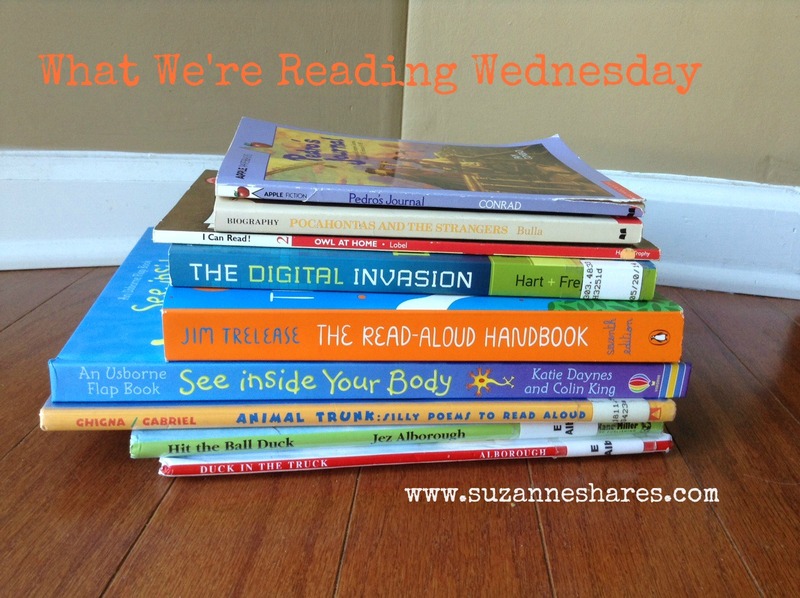 What are YOU reading this week?!?!? Comment below to share with us!